It’s especially important for seniors who have already incurred a lifetime of sun damage to protect themselves from skin cancer. 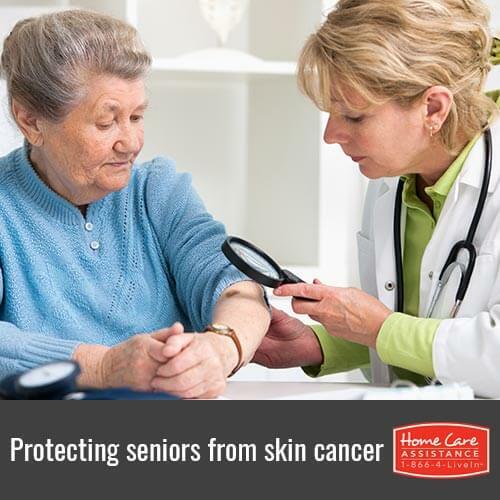 Fortunately, there are several effective preventative measures seniors can take against skin cancer. Home Care Assistance, a notable provider of home care in Rhode Island, encourages caregivers and family members to pass on the following tips to their senior loved ones. Every time you get sunburned, you increase your chances of skin cancer. Aging skin is thinner and allows more UV light to penetrate, so it’s critical to take extra precautions. To avoid burns and other damage, wear sunscreen of at least SPF 30 or higher. Be sure to choose a broad-spectrum sunscreen that protects against both UVA and UVB rays. For maximum effect, apply liberally 30 minutes before sun exposure, then reapply every 2 hours, or right after sweating or swimming. Many articles of clothing can block more UV rays than sunscreen, so cover up if you can. Wear sun-protective clothing like broad-brimmed hats and UV-blocking sunglasses. Seniors should stay out of the sun as much as possible, especially between 10am and 4pm when it’s brightest. Avoid tanning beds as they are highly damaging. If you drink a cup of caffeinated coffee a day, you may reduce your risk of getting non-melanoma skin cancer by 5 percent. Drink the equivalent of six cups a day, and it might decrease your risk by as much as 30 percent. This is due to the high levels of antioxidants in caffeinated beverages. Dermatologists can give you a full checkup to investigate changing moles or spots on your skin, and they can detect cancer in early stages more efficiently than regular MDs. A dermatologist can also give your skin various treatments to repair sun damage that incurred through your lifetime and remove precancerous lesions before they are a problem. This has the added bonus of giving your skin a younger, fresher appearance. Check yourself over once a month for any changes in your skin. Look for skin lesions that don’t heal within two weeks, or dark spots or moles larger than 6mm. If you notice any moles or bumps that have changed color, or are irregular or asymmetrical, schedule an appointment with a dermatologist to perform a biopsy. You can check these spots in a mirror, using a blow dryer to check your scalp, or you can enlist a partner and check each other over. By adopting a Mediterranean diet, which includes lots of fresh fruits, vegetables, whole grains, legumes, nuts, olive oil, and fish, your loved one could cut his or her risk of melanoma by 50 percent. So take yourself out to your favorite Italian restaurant and reap the benefits of all those healthy omega-3s and antioxidants. Be sure to minimize your dairy intake, though, and substitute milk with a glass of red wine. All those other antioxidant-rich foods, like blueberries, blackberries, raspberries, green tea, citrus, nuts, and dark green veggies, can have a protective effect against all types of cancer. Fresh, organic food is always a good source of antioxidants, but it’s never a bad idea to supplement with a multivitamin to cover any gaps in your daily nutrition. Skin cancer is a very real threat to people of all ages, but this is especially true for seniors. You can help your loved one reduce his or her risk of skin cancer and other illnesses by reaching out to Home Care Assistance. We provide numerous services for seniors including part-time or full-time in-home care, as well as Alzheimer’s, Parkinson’s, Dementia, and stroke care in Rhode Island. All of our care services include the use of our proprietary care methods that promote longevity and help seniors maintain cognitive, physical, and emotional health. Call us today at 401.284.0979 for your free consultation. Do Obese Seniors Have a Higher Risk of Cancer? Can Height Cause Certain Illnesses?